If you are looking for a gift for someone for a special occasion; Christmas, Birthday, Anniversary, Valentine's Day, Retirement etc. then consider classic car hire from an HCHG member. Members of the HCHG offer a tantalising range of classic cars for self-drive hire in a number of desirable locations throughout the UK. 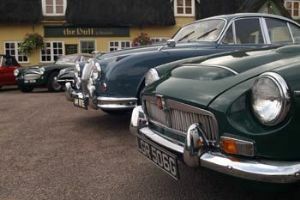 Classic cars can either be booked for the date required or Members can issue classic car hire gift vouchers which can be given on the day but taken up at a time of your mutual choosing. Either select the HCHG classic car hire member in your desired location from our national network map, or search the onsite database of Classic Cars for Hire for the most appropriate classic hire-car. You could of course pick your local member or consider where else you might like to take a fun classic car break together!